Outfit7 Ltd and Dream Theatre Pvt Ltd announced their partnership for taking Talking Tom and Friends to greater heights and to have access to licensed merchandise in India. Talking Tom and Friends has seen enormous success in its four-year lifecycle, having extended from a series of apps to a global entertainment franchise. 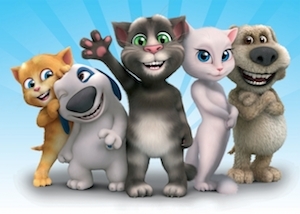 The first “Talking Tom” app was launched four years ago and the franchise has grown exponentially since. Outfit7 recently announced that the apps have been downloaded over 2 billion times. With this partnership, Dream Theatre Pvt. Ltd. has added another digital powerhouse brand to their existing success in this space. Dream Theatre will have deals spanning across multiple categories including apparel, sleepwear, kids wear, accessories, back to school, bags, games and puzzles in India. The licensed merchandise will be available at leading retail chain stores, department stores and standalone outlets, along with popular e-commerce portals. “We are very excited to be working with Outfit7’s brand Talking Tom and Friends and look forward to leveraging its popularity in India via quality merchandise”, said Jiggy George, Founder and CEO of Dream Theatre Pvt. Ltd.